Drivers on the New Jersey Turnpike can be forgiven this summer if they think they're seeing double just south of Exit 16W. The three 689-foot towers that have been home to WOR (710 New York) since 1967 are still there - but in the last few months, they've been joined by three more 668-footers, in a similar dogleg configuration, just a few hundred yards to the north. And if you've been following Tower Site of the Week for a while (particularly our visit last year to the 1967 WOR site), you know that within the next few months, those new towers (at the left side of the photo above) will become WOR's permanent site and the 1967 towers (at right) will come tumbling down, to be replaced by a golf course. 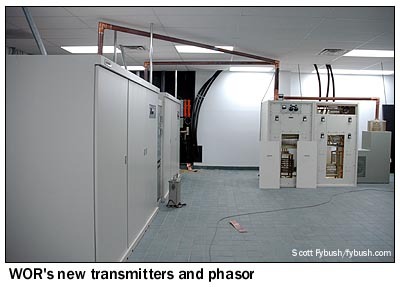 The new transmitter building (seen at right) is pretty much done at this point, with two new Harris 3DX50 transmitters all ready to be fired up inside the spacious transmitter room. Behind that garage door is, yup, a garage, now being used mainly for storage. 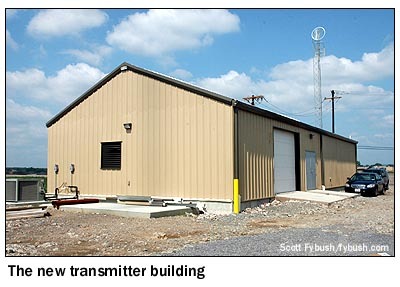 Closest to us in the building photo are the two rooms that house the generator, a big water tank and the rest of the heating, cooling and electrical gear for the transmitter building. 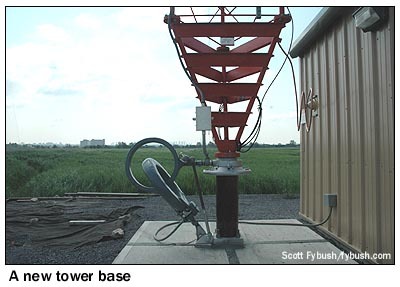 It's not easily seen in this picture, but there's one more interesting feature on the STL tower - a GPS antenna, for precision timing of the HD Radio signal WOR will broadcast from this site. You can walk to two of the towers over gravel causeways that lead back from the building, and WOR's Tom Ray took us back to one of the new sticks. 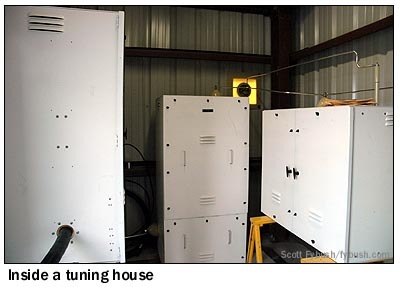 Much of the space inside the tuning houses is filled with filtering equipment to prevent the signals from nearby WSNR (620), WINS (1010) and WLIB (1190) from getting into WOR's towers. 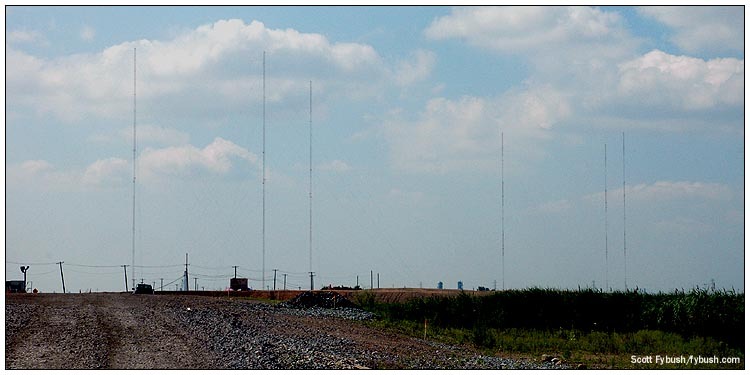 Standing at the new WOR site, you can easily see the three 1967 WOR towers, the five WLIB towers and the five WSNR towers to the south, the four WINS towers to the east, and even the three WEPN towers to the north. It's an awe-inspiring vista of big steel (23 towers in a single glimpse), and we're enjoying it while it lasts. 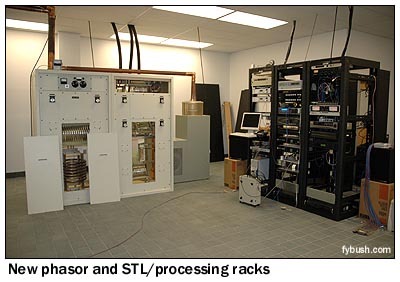 Thanks to WOR's Tom Ray for the ongoing tours of this facility! 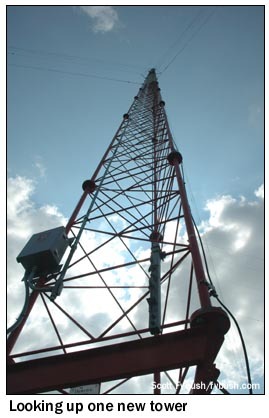 If you still haven't subscribed yet for this year, do it right now at our Support page - and enjoy another exciting year of Tower Site of the Week and NERW, guilt- (and password-) free. And if you have become one of our many subscribers, thank you!